Jeanne Chézard de Matel, in seventeenth century France, was called by God to found the Order of the Incarnate Word, dedicated to walk in the way of Jesus, the Word-Made-Flesh, and to proclaim God’s presence by being a gospel of love. I have destined you to institute an Order in my Name, that will honor my Person, Incarnated for love of humanity. 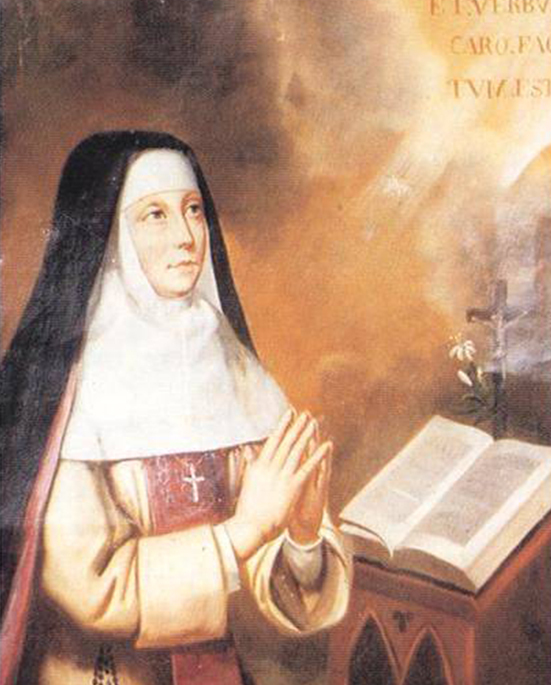 Born in Roanne, France, in 1596, Jeanne Chezard de Matel was called by God to be a foundress, mystic, author, teacher, spiritual director and theologian—at a time when women were not highly recognized in any of these roles. In love with the Incarnate Word, she passionately pursued the desire of her life, to “extend the mystery of the Incarnation,” by founding the Order of the Incarnate Word and Blessed Sacrament in 1625. She understood her vocation and the vocation of the Order’s members to be both contemplative and apostolic—a call to encounter the loving Word of God incarnate in Jesus, and then to enflesh that Word in ministry. Jeanne’s life was filled with struggle, opposition, periods of darkness and much suffering. But it was out of these ingredients of her human life fortified by the joy she experienced in her relationship with the Incarnate Word that God formed and shaped the woman that Jeanne became.